ITC’s nearly 450 member companies employ around 10,000 people a year. At least 75% of those are on part-time or short term contracts but nevertheless companies are responsible for them as employers. For very small companies making the transition from being a collective of ‘profit-share’ peers to taking on the responsibility of being an employer is often unexpected, unplanned and unpalatable. They need support in understanding their responsibilities – clear guidelines and a certain amount of flexibility in order to make the relationship work. An equally painful transition is experienced by companies who have been long term good employers when sudden loss of core funding leads to loss of security and capacity to offer the same level of good employment that had traditionally underpinned the company. Downsizing, moving people to short-term freelance contracts, engaging smaller acting casts, not being able to employ people full-time where tour dates are sparsely spread – are all measures that companies have been forced to take to stay alive. The Independent theatre sector does not appear to have shrunk ‘on paper’ but in practical reality many of the companies that exist in name have a fraction of the capacity to produce that they once had and are employing and engaging many fewer people. ITC Company Forest Forge recently devised a strategic approach to continuing after surviving for the past five years without their Arts Council core funding. They have reduced their staff team, many of whom will continue to work with them on a freelance basis. They will have to reduce the number of productions they create but are instead converting their building into a creative hub welcoming in local artists and companies to use the space and make work with them. Having said all that, this sector is still a beacon of good practice. Where money is less available companies are more likely to decrease their cast size than pay people less. The sector strongly supports Equity’s Professionally Made Professionally Paid Campaign and in fact set themselves higher standards than this. Most ITC companies adhere to or (at the very least) aspire to operate the minimum terms agreements made between ITC and Equity. ITC companies sign up to an agreed set of values which include the recognition that ‘good art thrives on good management’ and ‘theatre thrives best where people are put before profit’. This is not a sector where actors are treated like animated props. Small-scale touring relies on recruiting, nurturing and managing a good team – trust is the key to a successful production. 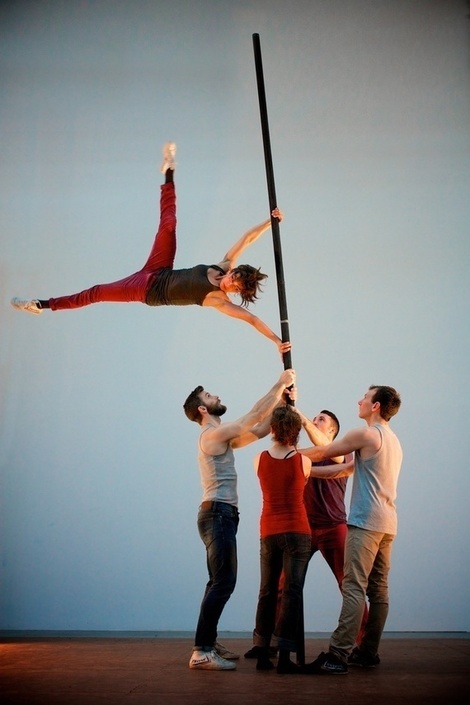 The most stunning example I have seen of this lately was Ockham’s Razor performing Tipping Point at The Platform Theatre. The work was physically extremely demanding and dangerous but the company worked together with absolute fluidity and coherence. This could only be achieved with extraordinary levels of trust and connection. Few independent companies have in-house human resources professionals – almost all money raised to make productions is directed to making what happens on stage the best it can possibly be. There is no slack in the system and very little spent on administration. So under these circumstances how do companies maintain good employment practice? Obviously ITC regularly updates the sector on legalities and practicalities affecting small employers and our advice service is there 5 days a week to trouble shoot, problem solve, mediate disputes and advise on good practise. The service is in constant use and these are some of the broader issues and challenges facing the sector we have been noticing recently. Senior/Exec recruitment has been difficult for many organisations lately. Many companies have had to go through recruitment processes several times before finding the right person. Salaries are not attractive and many of these roles are extremely demanding. I suspect the shortage is also attributable to lack of career progression opportunities in arts organisations. Funding cuts, downsizing, cutting out levels of middle management and loading the remaining jobs with too much work have led to stress, burnout, a serious decline in professional development and people looking beyond this industry for their next opportunity. Independent Theatre has always been a sector where jobs are varied, challenging and enable people to learn by doing and take on new responsibilities that develop their skills – this is only sustainable with good support, however, and we are noticing that the capacity of companies to successfully support this development is diminishing. For the past few years the demand for our training has been much more for very practical courses than for ‘softer’ management skills. Whilst this makes perfect sense in a challenging funding climate it does seem to be leading to higher staff turnover and lower levels of support and development. Most of our organisations are too small to afford to take on apprentices. This is a lost opportunity as often the most varied and interesting learning opportunities exist within small companies. We need to find a way to extend apprenticeship opportunities into the independent sector and provide more effective career progression. Small companies in this sector are actively committed to providing the best possible flexible working conditions for staff and many have taken a creative approach to supporting parents and carers in the workplace. ITC Company, Mimbre, was judged to be one of the Top Ten Family Friendly SMEs by ‘Working Families’ because of their facilitation of working mothers on their tour. This sector is very committed to improving diversity. ITC members signed up to a diversity pledge last year and are constantly looking for new ways to remove barriers to working within the industry. This year these efforts have threatened by restrictions to Access to Work and regressive changes to disability benefits. On February 11th at The Young Vic ITC members will be gathering from all over the UK at our 'People First’ Conference. We will be examining the role of the Independent Theatre sector as employers and discussing solutions to the many challenges facing them. YES to all of this. Look forward to the conference. I read an interesting book last year (which is apparently getting lots of traction in the business world) called Reinventing Organisations. The author Frederick Laloux gives loads of case studies from companies trying to reinvent how organisations work - less hierarchy, more soulful, creative, purposeful ... all the things we have a head-start on in the arts ... and yet ... we often fail people and we sometimes (wrongly I think) look to business for the answers when in actual fact - they are looking to us (when we're at our best). We should be innovating in this area as we rely on trust, creativity and the acceptance of a lots of different ways of working - even when it does not look like work. If your brain wants to refresh something then you should search for resources like spades card games. Here you need to know more importantly as it is not a short term entertainment but it provides a large number of steps. This blog Judge to lead on white patriot's discourse at college is extremely an imperative blog. in this blog we won't find out about sociology assignment help however we will learn new principles to pass judgment on a discourse rivalry. Along these lines we can state this is extremely a critical blog. The 2 years ago articles depicts the crisis conditions of the theater. the cinema authority must search, on the internet, of http://www.TopRatedEssayService.com of how old cinemas tackled their problems so that they can resolve their issues too and start making progress in their business. This articles, however, is really concise with respect to its meaning and context. Contact the Art Department of a local Assignment writing services UK - EssayAce.co.UK college, and ask if you could exhibit your works is considered one of their artwork indicates. Contact an Art Gallery (and ask them the same question), and post numerous of your works. Whenever you display a few artworks everywhere, make it known in a pamphlet or paper write-up approximately yourself. Go to the neighbourhood art shop in department shops, and ask for the name and deal with of the proprietor. Write to that person, and inform them you need to sell your paintings thru the shops (nationwide now and again). Write to radio and tv stations, and inform them in which your paintings is being exhibited (regardless of how small the display). Are you looking for a reputable place to buy essays papers? I work as a consultant on https://millionessays.com/ and we can help you. MillionEssays.com only hires writers with sound academic background and relevant experience. Professional assistance in writing essays and research papers online is a must. Don't lose your chance to visit us. If the question how to get answers for homework online troubles you a lot, don't worry, there is always solution. If you receive this task but do not how to complete it, do not worry! You can always count on PrimeEssays.com! This is good place to get independent theater employees opportunity. Visit at Digitalhikes the best digital marketing institute in rohini , it will guide you well in It sector. What an interesting post! Always like to read about theatre and theatrical performances! If you need to write a similar essay, you can visit our site here gogetessays and get help on writing an assignment. Our best team of writers will provide you a great service.